The Wall Street Journal writes about the increasing amount of Wi-Fi found as a feature on cell phones, allowing VoIP calls outside carriers’ networks: A number of cell phones now include Wi-Fi for browsing, but on platforms that allow third-party applications to be installed—like Windows Mobile or Symbian, but not yet the iPhone (we know this before it’s released, even)—VoIP packages can make the phones even more useful. This isn’t converged calling, like T-Mobile’s HotSpot@Home national network announced yesterday, in which Wi-Fi is used just like GSM, and is managed and controlled by the carrier and the handset. Rather, this is Wi-Fi used as an Internet connectivity tool over which arbitrary applications can run. It’s one reason that Apple and AT&T aren’t allowing third-party programs on the iPhone at launch. With well-designed Wi-Fi and a powerful operating system, it might have been a matter of weeks for Skype, the Gizmo Project, Bria, and other soft phones and VoIP software with existing Mac OS X clients to be adapted. The Wi-Fi Alliance released an intriguing study that shows the demand for converged calling: The study, conducted by ABI Research and the alliance, said that in a survey of 1,200 U.S. wireless subscribers, a quarter would switch to have cheaper prices for calling at home, while one third (when combining different responses) would drop a home phone line if they could get both better cell quality and lower prices when calling at home. Siemens and Nokia want to ease handoffs between VoWLAN and GSM networks: It’s appealing to companies and operators alike to have a single handset that can work on a VoWLAN within a company and GSM when roaming. The two companies will work on providing seamless handoffs. The specific products that will be improved are Nokia’s popular E series of phones and Siemens’s MobileConnect server for fixed-mobile convergence. The E60 is compatible, as is a Windows Mobile 5 smartphone from Fujitsu-Siemens. Dual-mode phones will rule the day: Wi-Fi-only phone models are unlikely to continue to be introduced, says a report from Juniper Research. While the report expects Wi-Fi handsets will become a $70b market by 2012, only two percent of those handsets will operate only on Wi-Fi networks. The rest will be dual-mode phones with cell and Wi-Fi. Cicero will release client software for the Series 60 Symbian phones for a kind of converged calling: Their software won’t support UMA (unlicensed mobile access), but it will work in a similar manner, requiring cellular operators to install back-office/back-end software to handle handoffs and accounting. Hello AS in Norway and Messagenet in Italy are the first two operators using the service—I had previously thought they were using UMA—and Cicero says 30 additional mostly European operators are in trials, with an Asian operator having a near-term launch. The New York Times reports that T-Mobile has launched its converged cell/Wi-Fi service in Seattle: It’s in my own backyard, but I haven’t seen it yet! The service will run $20 per month above a normal voice plan, which must be at least $40 per month. Two handsets are available, which cost $50 with a two-year service commitment. This service also requires a T-Mobile router, which the company charges for but offers a full rebate (the cost wasn’t mentioned). The service allows Wi-Fi roaming onto the T-Mobile HotSpot network, which comprises mostly Starbucks, but a few other chains, including Hyatt Hotels. The new service’s name is T-Mobile HotSpot @Home. The requirement of a specific router relates to the low-power mode of handsets that needs a particular protocol embedded in the router to work—WMM Power Save. Few routers have this right now, but it’s really a protocol-level feature, not a hardware change. However, it does require Wi-Fi Alliance certification if you want to use the label on the product, and thus adds cost at that level. The Seattle launch is a trial of unknown duration. The article also states that T-Mobile hasn’t said when it will launch nationally. Update: There’s more information at TheOnlyPhoneYouNeed.com, including the useful information that Wi-Fi minutes are unlimited (which usually means there are limits, but I can’t find disclosure at the site). At $20 per month, this is a very clever move on T-Mobile’s part, because it underprices similar VoIP offerings, and yet is untethered from VoIP. The Web site is also a place to sign up with T-Mobile for notification when they add HotSpot @Home to your market. This strategy of unlimited works well for T-Mobile. They currently offer a $30 per month package of unlimited GPRS/EDGE, and unlimited Wi-Fi usage on their network. That package also requires a $40 minimum voice plan. With the @Home offering, you could spend $50 per month for unlimited VoIP over Wi-Fi, mobile data (slow), and mobile data (fast). The company is testing the service with 50 families near the polar circle in Oulu, Finland: Nokia is putting its cell/Wi-Fi roaming to the test in the bitter north. The service will reportedly use unlicensed mobile access (UMA), a standard for handling seamless handoff, accounting, and authentication for converged wireless phone use. This is Samsung’s first dual-mode effort: The SG-P200 uses GSM and 802.11b/g, with the ability to handle voice and data calls. The phone has been launched in Italy and will extend to other European countries “soon,” according to IDG News Service. Three carriers in France are rolling out converged calling: The combined cell/Wi-Fi phones won’t be cheap, but the benefits of using Wi-Fi for less-expensive calls would quickly outweigh the initial phone outlay. No pricing is yet noted, unfortunately, and this will probably only be available as part of a bundle. Don’t expect Wi-Fi-only calling plans. Boingo’s network backs up Kyocera’s handset: The companies showed a prototype of a handset (running BREW as opposed to Java or Microsoft’s OS) that handles CDMA and Wi-Fi, thus being of utility to the American and South Korean markets, primarily. The handset roams onto Boingo’s aggregated hotspot network. Update: Boingo noted to me via email that I was missing an important aspect of this market. With a CDMA/Wi-Fi handset that can automatically authenticate to Boingo hotspots, a Verizon Wireless or Sprint Nextel user on the U.S. CDMA market can roam internationally—many countries have much more hotspot density than the U.S.—without getting a GSM phone for a trip or paying ruinous mobile roaming prices, which can be $1 to $3 per minute for U.S. GSM phones taken to Europe, Asia, and elsewhere. Unlicensed mobile access (UMA) appears to be hot topic at this week’s cell industry trade show: Boingo and Kineto on are that bandwagon, with Boingo bringing its hotspot aggregation and authentication platform to the party and Kineto its UMA system, which has both back-end and handset components. The collaboration will target Windows Mobile-5 devices. The two companies have created a system that combines an Atheros 802.11a/g radio and any of several Qualcomm CDMA chips: It’s a must for converged handsets that combine cellular and Wi-Fi functions that they’re as tightly integrated as possible to keep power consumption and costs low. Qualcomm thinks its EVDO trumps Wi-Fi for ubiquity, but they’re also fans of Wi-Fi for specific places (home, corporate campuses, etc.). Robust cell/Wi-Fi hardware just now appearing: Nancy Gohring of IDG News Service reports from the Fixed Mobile Convergence Conference in London that the components to make cellular and Wi-Fi work in the same handsets reliably are just now arriving. While there are devices already on the market, analysts are saying that the real goods have just started to appear: mature, next-generation chipsets, back-end software for cell operators, and other components. There are few plans available from operators, which might indicate the market’s nascent stage, and customers aren’t demanding it yet—probably because it’s hard to articulate. It’ll be another year before all the stars align, analysts say. Network Computing looks at the Voice over IP over wireless LAN landscape: Only 100,000 to 150,000 VoWLAN phones were shipped in 2004, but the market in five years is for tens of millions between converged and VoWLAN-only phones. Frank Bulk writes about the challenges of deploying VoWLAN handsets and infrastructure, from the high cost for phones to the rip-and-replace necessity for existing WLANs. Why can’t it be overlaid? Because phones have lower-powered radios than laptops and have to work in stairwells, and other interstices of business spaces. Nokia introduced three phones today, one of which brings Wi-Fi to the consumer level: The phones will be released next year for several hundred dollars each. The N80 uses Wi-Fi for Internet browsing and synchronization, and will also handle voice—but that feature requires a software partner they haven’t finalized yet, the company said in this AP story. The eBay acquisition of Skype has led to more talk about Wi-Fi and VoIP: Don’t buy into the hype that cell handsets will integrate Skype and Wi-Fi so that a single phone will let you call at very cheap rates (or free) from anywhere a Wi-Fi signal penetrates. Ain’t going to happen short term; long term, the entire telephony infrastructure is changing and both Wi-Fi and Skype will be part of it. There are three kinds of Wi-Fi + VoIP combinations: pure VoWLAN, which are IP phones used in an enterprise with a robust infrastructure in which the phone is essentially exactly like a wired, conventional phone—only better; roaming VoWLAN in which a phone can be switched to a mode in which it can be used at home or at work, but only on known networks; and hotspot VoIP, in which secret sauce is inserted into a phone’s software to allow it work at hotspots. The first market is already well developed, and it’s grown like mad in recent years. The increased security now available for enterprise Wi-Fi networks means that objections to offering VoIP over the WLAN have evaporated. The calls can be kept secure at several layers, making the voice traffic as secure as that going over a wired PBX setup or the PSTN. The second market is starting to emerge in which people will carry phones that have cell standards and Wi-Fi. The VoWLAN feature will allow a few networks to be characterized, and the infrastructure won’t be robust within the enterprise, but rather be outsourced. Calls are primarily made to and from the PSTN, if not exclusively. The third market is what has people holding their breath. When you look at companies like T-Mobile, which has a very poor U.S. 3G plan compared to its much larger competitors, Wi-Fi hotspots become their only tool to expand customer base and revenue. Further, they’re the only domestic hotspot network to have rolled out 802.1X security, which allows unique logins and unique encryption keys to be assigned over the local wireless link to each user on the hotspot network. They’ve already scored a consumer electronics deal with Kodak, which will ship software later this year for their already-delayed EasyShare-One camera with Wi-Fi: the camera will be able to use 802.1X to log into T-Mobile’s network, minimizing network interface configuration. Right now, most hotspots networks employ their own authentication schemes that allow a user to be connected to access. T-Mobile and iBahn are the only networks of scale that I know have 802.1X deployed. 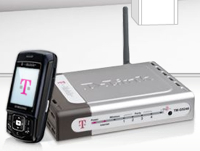 T-Mobile has it built into their own client; iBahn makes it available through standard 802.1X clients (found in Windows XP and Mac OS X 10.3 and 10.4). Authentication remains the boring issue that has prevented the kind of growth (until lately) predicted for hotspot use. Authentication creates walled gardens for each user base. Companies like Boingo, iPass, and GoRemote have had to build client software that handles the authentication differences behind the scenes in order to aggregate the dozens of distinct hotspot networks in their system. Boingo has experimented with VoIP over Wi-Fi hotspots through Vonage, but you had to be an existing Vonage subscriber, have a Vonage soft-phone subscription, and be a Boingo subscriber. The Boingo/Skype deal is essentially a pricing relationship that allows the use of Skype only on hotspots that Boingo aggregates for less money. All these pieces to make VoHS (VoIP over Hot Spot?) work means that there’s a large software component and many intermediate pieces involved in the chain from voice conversation out to the Internet over an arbitrary hotspot. Essentially, lack of roaming across all major networks at a reasonable price prevents VoIP over hot spot from becoming a near-term ubiquitous reality. Cell handsets aren’t easily upgradable, and it’s likely that the kind of software necessary to allow a handset with cellular and Wi-Fi support built in also will require frequent updates. Which brings us to SK-EarthLink. The partnership between the largest telecom company in South Korea, and one that deploys some of the most advanced handsets and devices on their network in the world, and EarthLink bodes well for VoIP over hot spot. Because SK-EarthLink will be a MVNO (mobile virtual network operator), reselling access probably from Sprint PCS’s voice and 3G network, it will be in their interest to offer the best price with the most advanced features using the most conserved cost. You can see the convergence. While Boingo is apparently just one of the suitors to be part of the SK-EarthLink deal—Boingo/EarthLink founder and SK-EarthLink CEO Sky Dayton has to recuse himself from business deals that involve Boingo—it’s likely to use its aggregated portfolio combined with existing VoIP-in-the-field research to make a good offer. The handsets that SK-EarthLink offers could be the real portent of the future of this third VoIP over Wi-Fi market: the handsets could, one hopes, have cell voice, 3G data, and Wi-Fi built in, switching voice and data to the cheapest available network, whether one’s home, work, or hot spot. If SK-EarthLink can achieve that, they could represent the first real convergence in a way that benefits consumers—and threatens the foundation of the entire phone business. Ironic, then, that they’ll be buying service from Sprint to do it. Techworld takes a look at a phone that can use the cheaper network: The CiceroPhone turns a Pocket PC device into a telephone, and it can route calls over a Wi-Fi network when it’s available, choosing cellular when not. The intent isn’t for hotspot use, but rather in making a single device roam across a user’s common working networks, such as home, remote offices, and possibly intra-office. Cicero claims its phone is first to dial out over both networks and to switch between them dynamically. Peter Judge, author of the above article, also separately reviews the CiceroPhone, and finds it quite good and flexible, although voice quality needs improvement. The fact that any SIM can be inserted and you can configure which calls by phone number are routed over which network is a good glimpse of what the future could be like on a dedicated handset—if carriers and handset makers allow it. Interesting outlook in Time Europe on how Nokia, Motorola, et al., are claiming their own position: Using VoIP and Wi-Fi handset makers can reduce their dependence on cellular operators. Customers want VoWLAN phones or at least phones that can use Wi-Fi as one option for transferring data and handling voice. In 2010, mobile revenue will be $550 billion—and the handset makers can reassign where that money goes. Nokia says that next year, Wi-Fi will be a standard feature in its multimedia and business phones, the article notes, as well as midrange models. Motorola should be integrating Skype software with some phones next year. In-Stat’s Alan Nogee—a smart analyst—estimates a huge growth in handsets with Wi-Fi: 13.5 million in 2007, 52.8 million in 2008, and 136 million by 2010. The article notes this might be conservative and I agree: as with Wi-Fi growth curve, it either explodes or fails. Osaka Gas in Japan is building a network that will allow employees to roam between a WLAN and the wide area cellular network: Workers will have dual-mode cellular/Wi-Fi handsets that reportedly will seamlessly hand voice calls between the networks. The service will use NTT DoCoMo’s cellular network. It’s not clear how many people will have the devices, but the WLAN will support voice and cover Osaka Gas’ 50 offices. This is a pretty impressive system and one of the earliest to support seamless handoff of voice between cellular and Wi-Fi. I shouldn’t be surprised to see it happening from NTT DoCoMo, which has traditionally been pretty forward-thinking and willing to embrace new technologies. Many operators elsewhere seem to be regarding such converged solutions as a potential threat because calls are handed off the cellular network onto a network owned by an enterprise. It’s unclear, however, how this deal was set up so there’s a chance that NTT DoCoMo is retaining some sort of control over services that may be available over the WLAN or is somehow otherwise benefiting from the WLAN piece. NTT DoCoMo said it will sell a combined Wi-Fi/3G phone from Motorola: It doesn’t sound like this device specifically supports voice over Wi-Fi or that connections could be handed off between the two different networks. Nortel and BB Mobile said that they’ve demonstrated roaming between 3G and Wi-Fi in Japan. Nortel’s system could allow the handoff of voice calls between the networks. BellSouth said it is trialing a converged WLAN/cellular enterprise offering: Employees of a company will use a converged Wi-Fi/cellular handset that carries voice over IP over WLAN calls on the corporate campus and uses Cingular’s cellular network off campus. This is an ideal offering from a company like BellSouth. I’m assuming that the company’s broadband is supplied by BellSouth, so while BellSouth may be offloading calls from its cellular network (Cingular), it is offloading those calls onto its own wireline network. It’s cheaper for BellSouth to carry those calls on the WLAN then the cellular network, so depending on what it might charge for such a service it can be a good revenue generator. While this is a trial with just one company, I’d expect other operators that own wireless and wireline networks to soon follow suit in exploring these offerings, if they haven’t already. Alcatel and Nokia both said they’d support the Unlicensed Mobile Access initiative: The companies backing UMA are developing a standard way to integrate Wi-Fi and cellular networks to allow seamless voice roaming. The UMA group doesn’t technically exist any more because it is now an official 3GPP initiative. NTT DoCoMo said it will launch a combined Wi-Fi/cellular voice service for consumers next year: Using combined Wi-Fi and cellular handsets, customers will be able to use voice over Wi-Fi in their homes and get charged the same rates as if they were using their landline phone. For a company like NTT, which I believe is also the incumbent landline operator, this kind of service makes loads of sense. It means that while NTT may be displacing traffic from its landline telephone service, it is still carrying that traffic and charging the same price for it while delivering it more efficiently over IT. Unfortunately this article has no more details on which vendors or standards NTT may choose to use to offer the service. Most U.S. cell phone operators are still wary of enabling voice over Wi-Fi: That’s not much of a surprise, though their attitudes will likely have to change in the future. Ultimately I think that one of the smaller cellular operators or maybe even an MVNO, if they can figure out the backend, will be the first to offer a converged Wi-Fi/cellular offering and the rest will have to follow their lead. Frank Bulk offers a great run-down of the different bodies working on cellular/Wi-Fi convergence at Mobile Pipeline: There are five such groups. That number is both an indication of the interest in this space as well as an indication of how many different types of companies stand to benefit from such convergence. Each of these groups is going at convergence from a different perspective that would benefit the members. Hopefully they won’t all create a tangled mess that makes it impossible to settle on a standardized way of voice roaming between cellular and Wi-Fi. Motorola is expecting to release a converged WLAN/GSM phone this summer: The phone will be the result of the oft-trumpeted work happening among Motorola, Avaya, and Proxim. The companies have also formed a group called the Seamless Converged Communication Across Networks Group, which has been joined by some other companies. A Motorola spokesman here attempts to clarify the difference between SCCAN and the Unlicensed Mobile Access group, of which Motorola is also part. SCCAN is particularly trying to figure out handoffs between corporate WLANs and the wide area cellular networks, targeting the enterprise customer. He says it’s not necessary for one of the groups to supercede the other, but I guess we’ll have to wait and see how they evolve. BT says it will have a Wi-Fi/GSM phone that can roam between the two networks by the end of the year: BT has been talking a lot about its Bluephone initiative, which will use Bluetooth in the short range and GSM otherwise. The operator has said that it will use Wi-Fi instead of Bluetooth as soon as it can. BT is likely to limit users of any such combined phones to use the shorter range technologies only in their homes or potentially offices. Customers are unlikely to be able to use them at an Wi-Fi hotspot. Talktelecom bought a solution from Cicero Networks to support a voice over Wi-Fi offering: Talktelecom resells telephone access to corporate customers. It recently said it had completed a trial of voice over Wi-Fi in Dublin. Now it has announced that it purchased equipment from Cicero Networks including a softphone client so that customers can use dual-mode devices to make and receive calls over Wi-Fi or over GSM. The previous stories covering Talktelecom’s trial hinted at software that Talktelecom would offer customers for download on their phones and I suggested that only PDAs or handsets with certain operating systems allow customers to download additional programs. Devices that run on Windows Mobile, Symbian, or Palm software might allow such downloads but the bulk of phones out there likely don’t. I would doubt that seamless handoffs between the Wi-Fi and GSM networks would be available from Talktelecom, unless the company is able to strike some sort of deal with the cellular operators and I would find unlikely in this market. Network World has a good two part synopsis of what is going on in the converged cellular/WLAN space: The piece concludes that the main reasons that enterprises would want such a solution is to save costs on calls made both within the enterprise and to locations outside of campus. Such converged networks also supply a single contact point for executives, which realistically isn’t a huge deal because many people already pass out a single number and just use call forwarding. A BridgePort executive claims that big enterprises are telling telcos they won’t pay for calls made between employees on campus. I’m a little unclear on the point here, but I think that he’s saying that enterprises don’t want to pay the wireline telcos for calls between employees on campus and that presents an opportunity for cell carriers who, by offering a converged device, can be in control of calls that are made over Wi-Fi networks on campus. That means the cell carrier gets the business of carrying calls on campus but doesn’t have to extend or add capacity to its mobile network because the calls will be carried over Wi-Fi. That’s a logical thought, but I’m a bit skeptical about whether enterprises are pushing telcos for free calling on campus. They may be pushing, but until the threat of something like voice over Wi-Fi becomes a reality, I can’t see why the telco would want to give that service away. There is plenty of activity in the converged cellular/Wi-Fi space and while I often argue that there’s not much in it for the cellular operators, I suspect that the service is inevitable. The cell operators may resist as long as they can but at some point they may have to capitulate and try to get whatever benefit they can from the offering. One such benefit would be to win enterprise business such as the scenario described above. But they’ll have to weigh that benefit with the possibility of having to hand calls over to hotspots that they don’t own.